A lovely review written by Michael Doherty for Kelly Martin Speaks blog about our ground roasted Orzo Coffee. Martin writes "I was pleasantly surprised by Orzo Coffee, because I have tried other coffee substitutes in the past, and haven’t liked them. Many of them left a very bitter aftertaste which was unpleasant, but not this one". Read the full review here. You can also follow Kelly's updates via Twitter & Facebook . 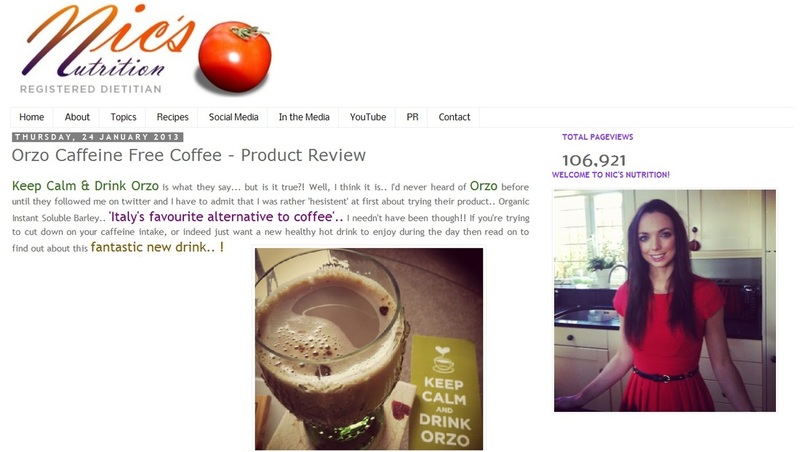 Mummy Rated gives OrzoCoffee thumbs up! 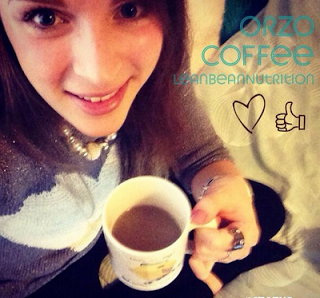 Mishu from the popular Vegan blog To Happy Vegan has reviewed our ground roasted OrzoCoffee. Read what she write: "... it has that roasted flavour about it.The thing I really love is that you can get it ground which means I get to use my faithful old cafetiere. I didn’t realise how I had missed my weekend ritual of brewing the coffee and pushing the plunger" . Read the full review here. Follow Angela on twitter ! 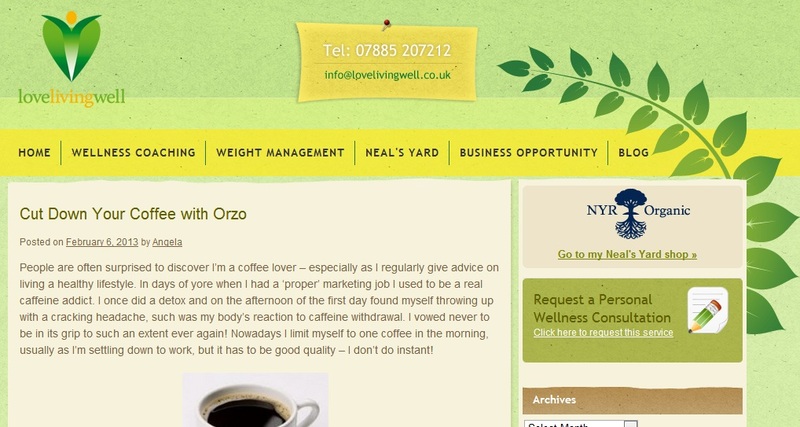 Another fantastic review about OrzoCoffee from the Nichola Whitehead (BSc hons, PG Dip, MSc, RD) a specialist dietitian. it and poured another cup! This is how I personally like my OrzoCoffee: 1)Mix 2 level teaspoons of Orzo in a mug with 1 tsp of stevia (natural sweetener), 2) Add freshly boiled water, 3) Top with skimmed milk or soya milk and stir well"
Orzo Coffee gets reviewed by the blog of a 'Scatty Mum' . We could not find a more 'demanding' reviewer as we know that all breastfeeding mums want only the best for their little ones. This fab blog is about anything and everything to do with life with two small boys and the writer is a Breastfeeding Advocate. 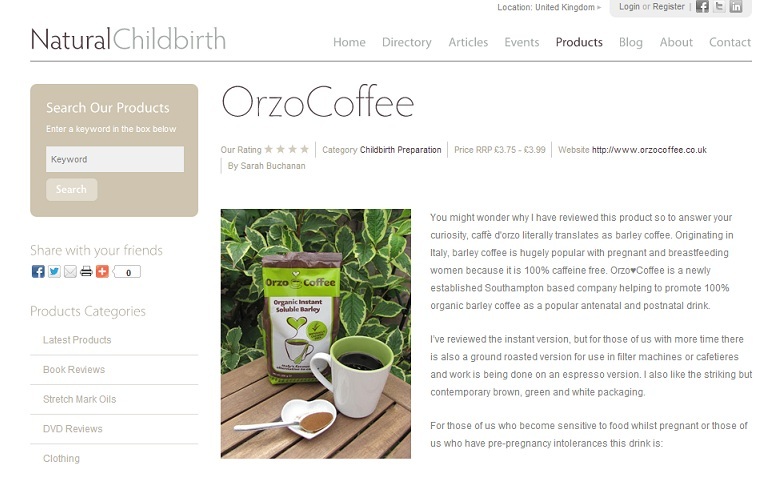 The lovely Sarah Buchanan from Natural Childbirth has reviewed our orzo coffee for all the mums-to-be and new mums. Here are some reviews written by you! If you have tried Orzo♥Coffee and would like to write a brief comment for our readers on our website, please fill in the contact form below. I am extremely pleased with both the instant and ground versions of Orzo and purchased enough to pass on to family members who had expressed an interest in coffee alternatives. My wife cannot drink ordinary coffee, caffeinated or decaffeinated, and we predominantly bought Orzo for her. My wife now is able to enjoy something other than tea and is very pleased with the taste. I thought it was delicious and it's a great alternative for when I want a coffee or hot drink. I only have 1 coffee a day and don't feel it's healthy to have more than that, so this is a great solution. I cannot drink coffee due to having a thyroid problem. I bought your Orzo coffee and pot set a while ago. Since I bought the set I am using the orzo coffee in the pot as well as my barista machine. Wow it makes wonderful lattes and cappuccinos, without the want of coffee. Many thanks. Would recommend it to anyone who has a coffee allergy. I eat a very healthy diet and my one bad habit was coffee! The problem was I saw it as my treat of the day and drinking a herb tea instead felt really unfair! I've been absolutely delighted with orzo coffee I still feel I'm getting my treat and it tastes and feels like the real thing but the bonus is its healthier ! I haven't even craved a normal coffee since drinking it so it's now an obvious choice for me! I love how you can make espresso and cafetieres with it too - brilliant! Just met you and tried your lovely Orzo coffee at the Winchester Guildhall. Look forward to putting the cafetiere on :) Nice to support local. Just brewing my second cafetiere of the day - gorgeous! Thanks for the recipe link, much appreciated ! Discovered orzo in my local health food store looking for a coffee alternative while I am expecting my second child. It is now become my daily treat. When friends visit and see me with my black coffee brewed in the cafetiere they all start telling me that I shouldn't drink so much coffee... they never guess that it is orzo and naturally caffeine free! I gave up caffeine, but having been a habitual coffee drinker for twenty five years, I was going to be fussy about any alternative. But I read about this product from Italy, and you know, it is as good as they say! It is a lovely strong, but not overpowering, flavour and yet it isn't just a coffee substitute, it is a good drink in its own right. And don't believe it is like the UK's Barley Cup or other chicory based ersatz coffees, they are nothing like Orzo, and Orzo is far superior. This product deserves a wider audience! Thanks for the sample. Just drinking a cup now and enjoying it - much better than instant coffee and no doubt healthier too. AMG has been testing Orzo Coffee and has been very impressed. One member of staff does not drink coffee so for him it’s been a great alternative. We have been brewing it in a cafetiere, not only does it taste and smell like coffee but it has the same mouthfeel which is important to the enjoyment of a drink. Thank you for the sample, which we have duly drunk.I am an dedicated coffee drinker and to be honest I did not expect any great result from the Orzo.I was absolutely wrong the product is amazing and I would use it to reduce my Caffeine intake. Other Barley substitutes I tried have been weak and tasteless and your product stands out for a number of reasons. 1. I looks great, dark roast and brews brilliantly. 2. Flavour is mild and not a burnt taste. 3. Low in acidity as it did not curdle my Soy Milk. 4. It acts and looks like a coffee, so it is easy to substitute for coffee mentally. Let me know when you have stock available. Thank you for the coffee it is really delicious ... My husband and I had some this morning and my daughter and my brother shared 1/2 a cup this afternoon. We all thought it great (My brother has lived in the US for 40 years and is very particular about his coffee) I asked him to taste it and he said it was very nice before he even knew what it was, praise indeed. I liked it more black than white and I don't usually like black coffee. Let me know when I can buy some. Post us your comment on Orzo♥Coffee ! We do not censure comments (but make sure they are not offensive or rude to anyone). We really appreciate your feedback. Dear @OrzoCoffee, Can I thank you again for your "coffee". It makes my morning every day. Please keep doing what you do. Have you tried @OrzoCoffee whilst trying to give up coffee? I can't have caffeine, but the Orzo tastes so coffee-like! No caffeine but @Orzocoffee tastes like the real thing! Anyone who can't drink coffee or wants to cut down on caffeine try @OrzoCoffee, it's roasted barley and it's lovely. @OrzoCoffee Just tried my first cup...already converted!! @OrzoCoffee I lived on it when pregnant and prefer it to coffee now! @OrzoCoffee is going down really well in the shop, people are intrigued! @OrzoCoffee Just having my first try of your lovely drink, what a wonderful alternative to coffee! Guilt free at last! #orzolatte using coconut milk, its caffeine free & dairy free ! @OrzoCoffee V impressed with your BarleyCoffee. It is has a good clean, rounded flavour-Also flavoured some flapjack topping with it=V GOOD! @OrzoCoffee Wow, what a flashback! I grew up with my Nonna making me Orzo when all the grown-ups were having their after-lunch coffee! I love coffee, but @OrzoCoffee is a happy alternative without the caffeine. Loving that I've switched to @OrzoCoffee and i dont feel iI'm missing out! What healthy changes are you making this week? I am absolutely loving @orzocoffee what a great alternative to coffee tastes like the real thing! @orzocoffee I have been really enjoying it! I love the mellow flavour and the fact that it is caffeine free! @orzocoffee thx for the follow! I just discovered orzo coffee while in Italy this year. Love it! @OrzoCoffee The samples have arrived and they're delicious! Can't believe it's made with barley..
@OrzoCoffee We've had a few of people try it with good results :) it's certainly a massive improvement on decaf coffee! @orzocoffee Thanks for the info. Hubby is Italian and is missing his orzo! @OrzoCoffee that article looks familiar :-) loved your coffee & will be getting more. You coming back to #Petersfield? @OrzoCoffee I was sceptical as I love a good strong coffee but this was very delicious, and caffeine-free amazing! @OrzoCoffee I drink orzo every day!! I grew up with it. A very refreshing and lovely drink. Excellent for children too! Love your site! @OrzoCoffee Thanks for your RT. Orzo is so good, and here it's very popular, isn't it @lamanumiura ? Greetings from Italy! On my health kick I've discovered barley coffee by @OrzoCoffee - tastes so good with soya milk & caffeine free! Why didn't I find it before? @OrzoCoffee Just found your 'alternative' coffee and loving it. 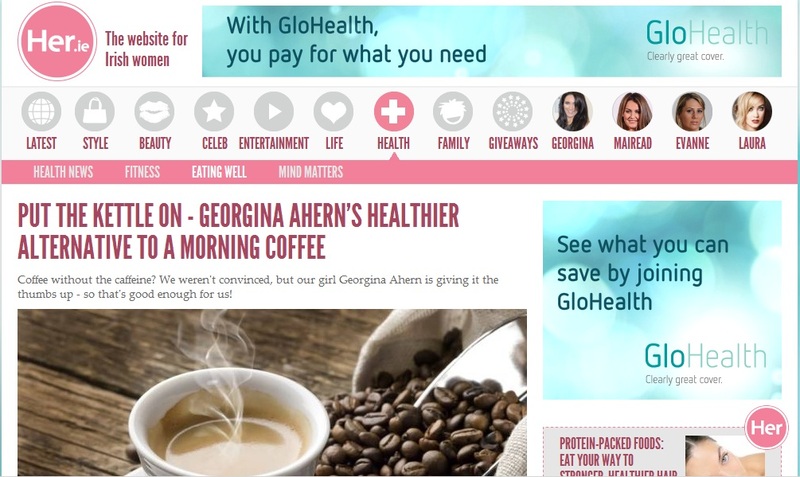 Health problems mean avoiding tea/coffee, so finding you a godsend!